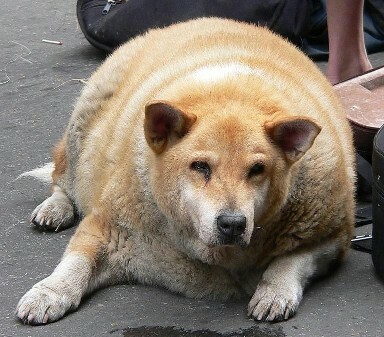 The number of overweight pets in the United States is increasing every year. It is estimated that as many as 25% of dogs and 30% of cats are overweight. Just like in people, diet and exercise are extremely important in preventing this growing epidemic from affecting your pet. Overweight pets become more prone to heart disease, arthritis, breathing problems, diabetes, gastrointestinal problems and much more. We are all very busy, and sometimes our pets don't get that nightly walk they once did. However, just increasing your pet's activity a small amount can vastly affect their metabolism in a positive way. A rousing game of fetch or a walk around the block just twice a week can have a positive impact on your dog's health (and yours, too!!!). It is also important to feed a high quality premium diet. Many lower quality diets have a large amount of fillers, which just leave your pet hungry in just a few hours. Feeding the right amount is important as well. Look on the bag, and you will find a guide to how much to feed daily. We recommend dividing this amount up into two meals daily. If you are feeding treats regularly, adjust the amount of food you feed accordingly. As far as treats go, feed a high quality treat, and do not go overboard. We recommend Hill's t/d as a regular treat to promote good dental health. We also recommend Purina Lite Treats for those dogs who tend to put on a few extra pounds. Feeding scraps off the table will quickly lead to obesity, and can even cause more serious health problems, such as pancreatitis.